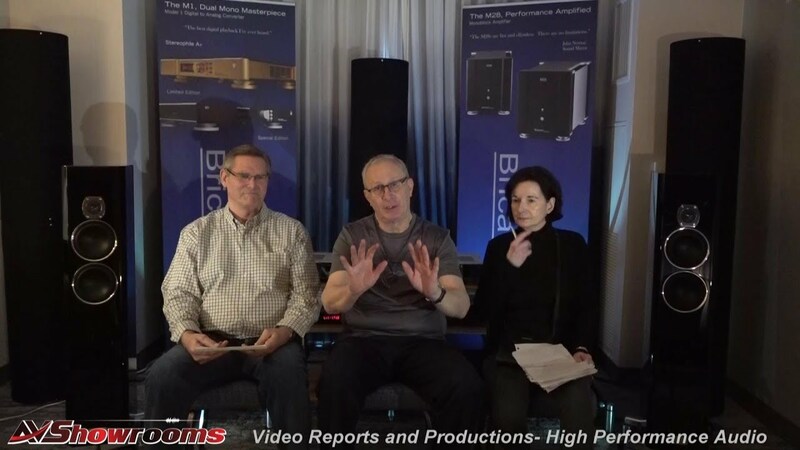 Michael Borrenson, chief engineer and designer of the Aavik electronics and Ansuz cables introduces two new products at hifideluxe, this year. First, Michael explains in detail the new Mainz8 D2 power distributor that utilizes the D-TC technology to eliminate noise in the main system. 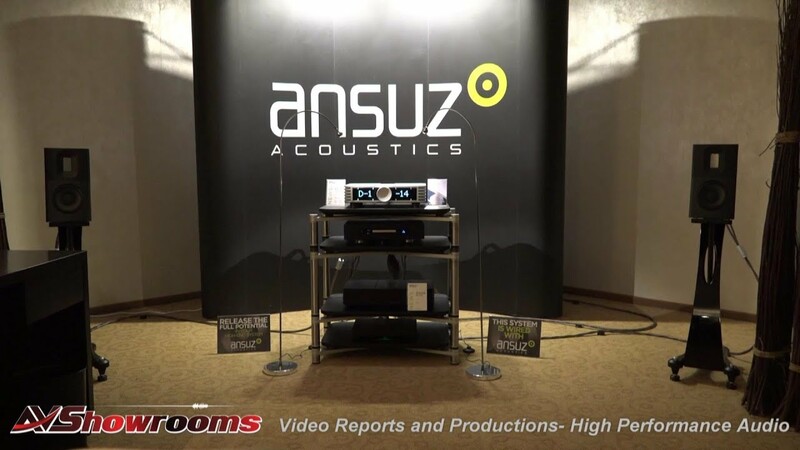 The AVShowrooms’ video gives Michael the floor to elaborate on the new product for those who are interested in the line and for the already fans of these cutting edge brands. The second product is an equipment rack with an aluminum sub-frame and titanium uprights, again explained in full by MB, himself. 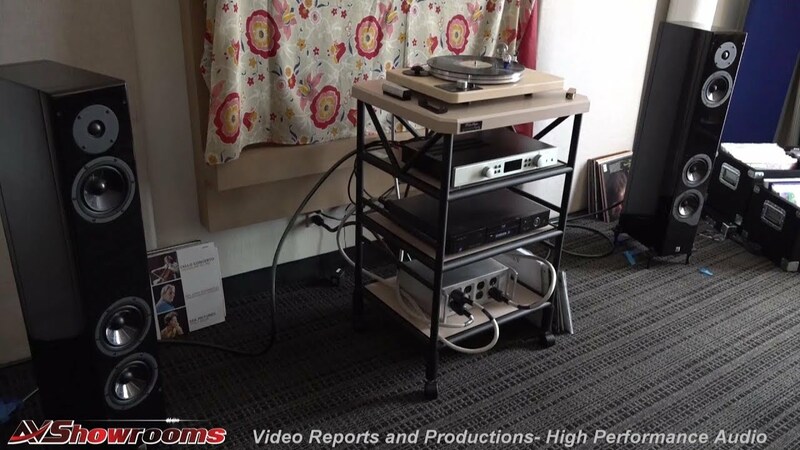 The system set-up in the room included the U-150 integrated amplifier with phonostage and DAC, the D2 cables introduced this year, the Mainz8 D-TC power distributor and the, cult-favorite, 2-way standmount speakers, the Raidho D1.1’s. Listening to Fink’s “Wheels Turn Beneath My Feet” the sound was lightning-fast, dead quiet and emotionally involving – racks do make a difference. 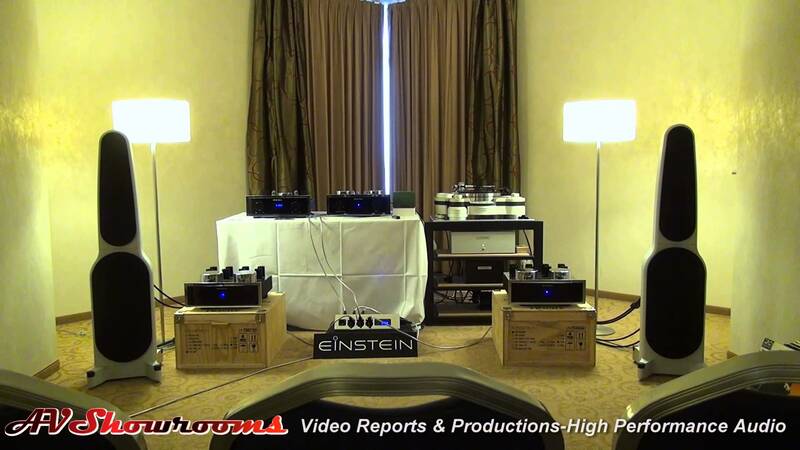 The room featured the Alsyvox SL planar loudspeakers and Timeless electronics. 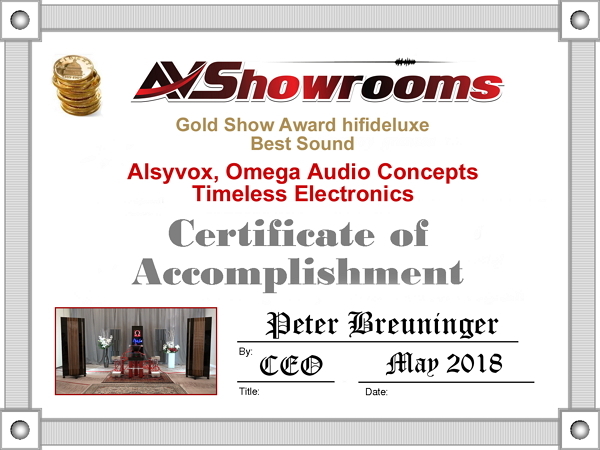 Not only do I think this was the very best sound at hifdeluxe 2018, it was the most beautifully designed exhibit room thanks to Daniel Cohen of Alsyvox’s talented wife. 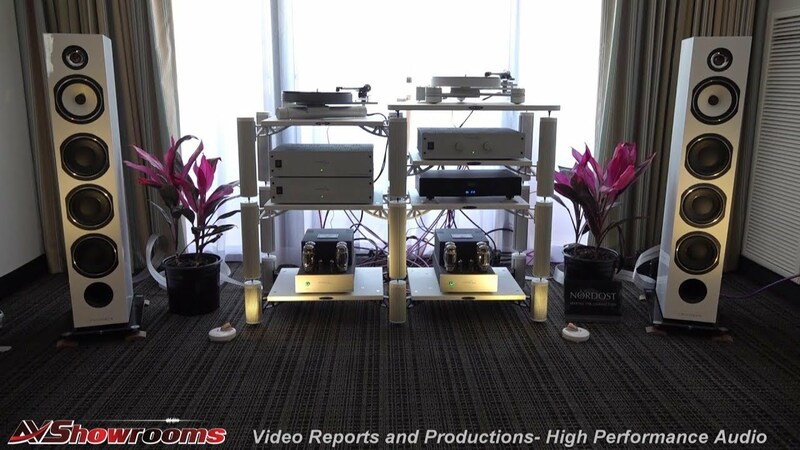 The CD transport, DAC and power supply brought to mind a cauldron (don’t miss the AVShowrooms’ video!). The cabling is Omega Audio Concepts very own patented design shown in a fire engine red taking center stage arranged in a creative sculpture. 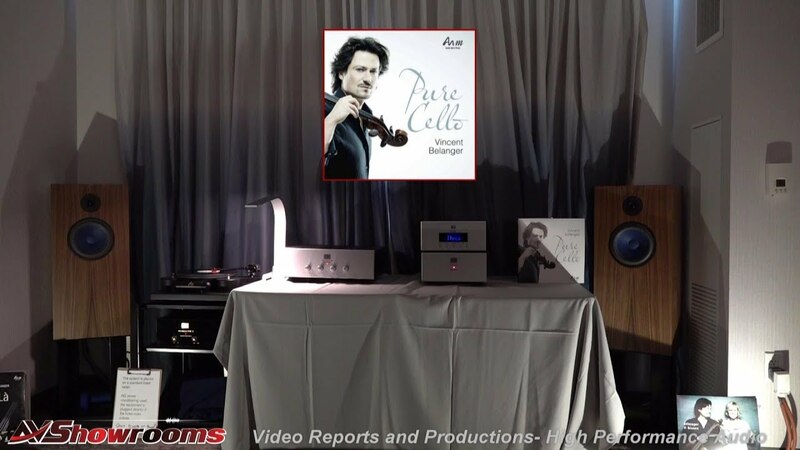 The Alsyvox Botticelli loudspeaker, the midsize of the line, is a 3-way, full ribbon speaker featuring a unique woofer concept with push-pull magnets. The CD we chose for the listening session is the track “Terre” from the Michel Jonasz Trio. An articulate sound that was enveloping and warm with no sacrifice to detail. Organic and full. Featured in the Audio Note UK room at hifideluxe 2018, were the AN-E/SPe loudspeakers in an attractive slate veneer, the Meishu Phono Silver 300B Single Ended Phono Integrated Amplifier and the new TT-3 turntable with the external power supply, now in production. Mario Binner guided us through the system and Vincent Belanger, the Audio Note Music brand ambassador introduced us to the remaster of the album “La”, now on vinyl, originally recorded by Fidelio in 2011. One of the tracks we played from “La” was track one on Side B called “Scene 1 de l’opera Nelligan (A Gagnon). The Audio Note system beautifully reproduced this melancholic piece pulling at my road-weary heartstrings. The sound in the Audio Note room, sponsored annually by the AN distributor, Germany, Alexander Voigt, was room-filling; detailed, yet warm and my uber-emotional response to the system was my usual to that signature Audio Note sound. 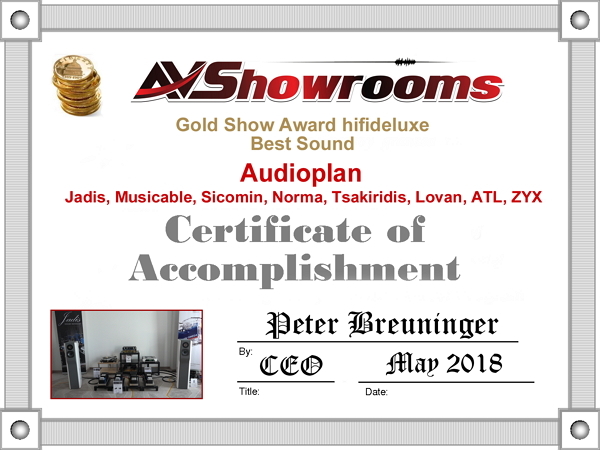 Audioplan, a German dealer/distributor of Jadis electronics and turntables showcased their Concert III 2- way loudspeaker, Jadis amplification and a new Jadis turntable described by the room operator as the “little sister” of the Thalie with an Ultimate Omega cartridge, for the source. Watch the AVShowrooms’ video and check out how you change speeds on little sister! 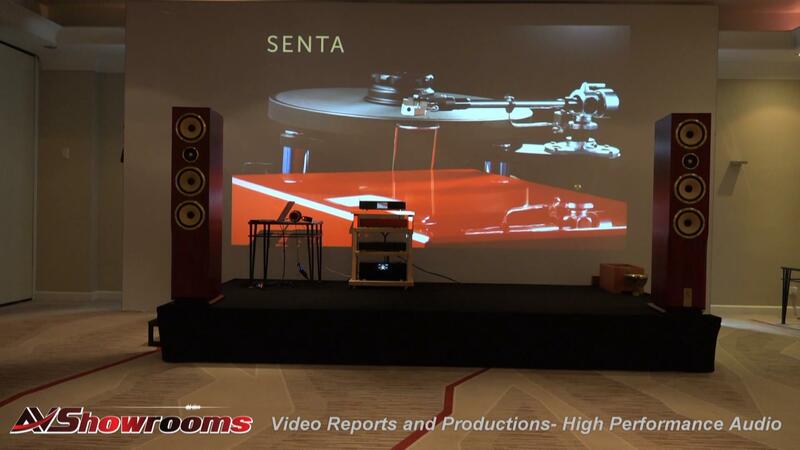 Spinning up “Nublado” from the album “Sera Una Noche” was proof again that the Audioplan room and its fine products produced one of the best sounding rooms at hifideluxe 2018. The sound was musical, detailed with a marked separation of instruments and not a smidge of compression. 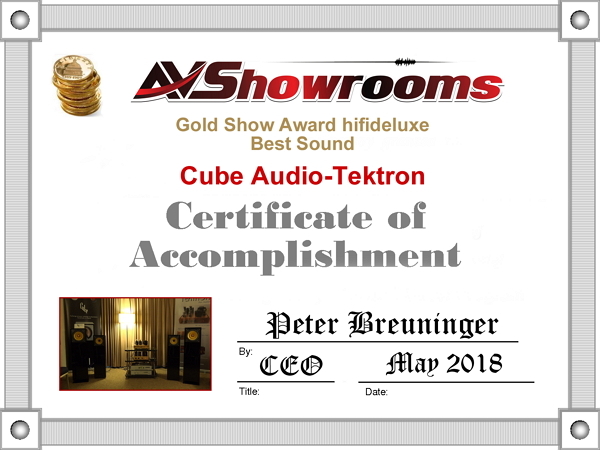 The representative of Cube Audio, Grzergorz Rulka, walked us through the Cube Audio/Tektron room. Cube Audio, located in Poland, manufactures full range drivers and loudspeakers. The Cube Nenphar loudspeaker which translates to Cube Water Lilly in English debuted at hifideluxe 2018 with the new 10 inch Cube driver, the F10 neo. Grzergorz talks about the flower design of the drivers, with four cones, on the AVShowrooms Video. The speakers, driven by the Tektron tube electronics, went way down and deep on a track from the Fidelio recording, “Les Sept Paroles Du Christ”. The sound was big, bold, fast and accurate. 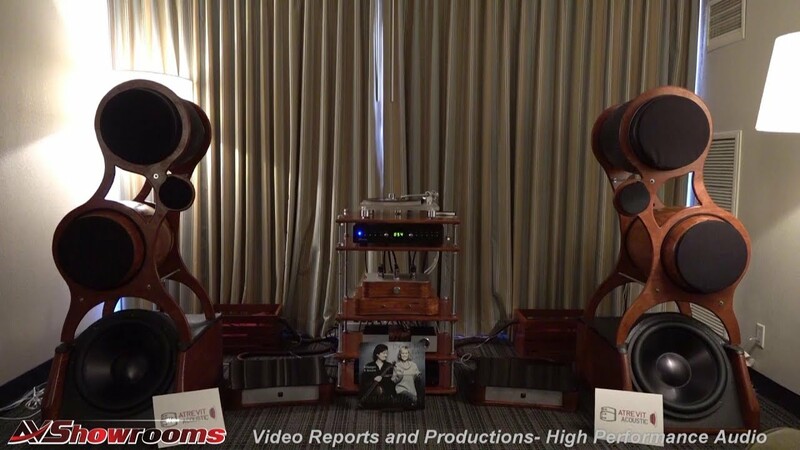 Giuseppe Gabbarini walked us through his exhibit which included the Diesis horn open-baffle loudspeakers the Number One Limited Edition, a model designed to work with Kondo triode amplification. Giuseppe played a Flamenco recording on the Vyger turntable that shook the room, then moved on to “Nublado” from the album “Sera Una Noche” recorded by MA Recordings. The sound was realistic with transient speed expected from a world class horn loudspeaker. One of the best sounds at the show. 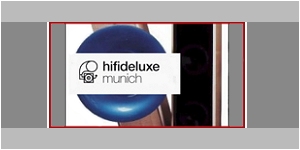 Dieter Mallach’s room is consistently one of the best sounding rooms at the hifideluxe. Featured with Malvalve’s usual large array of electronics was the MalStat Four loudspeaker with a magneticstatic midrange and woofer and an electrostatic tweeter. The power amplifier driving the system includes the control unit, power supply and the unique outboard, output transformer. 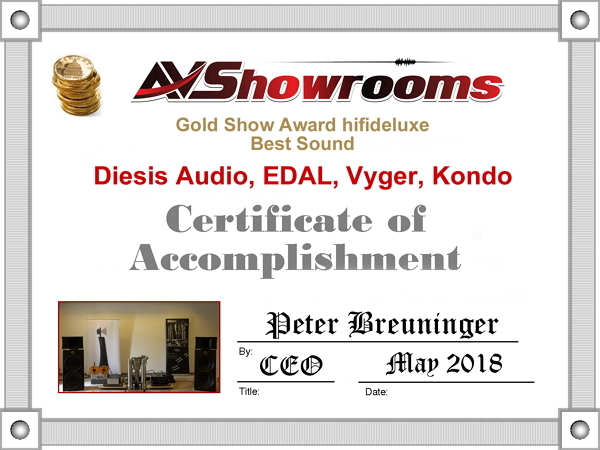 Dieter also showcased his new Head Amp Five that can also drive loudspeakers. 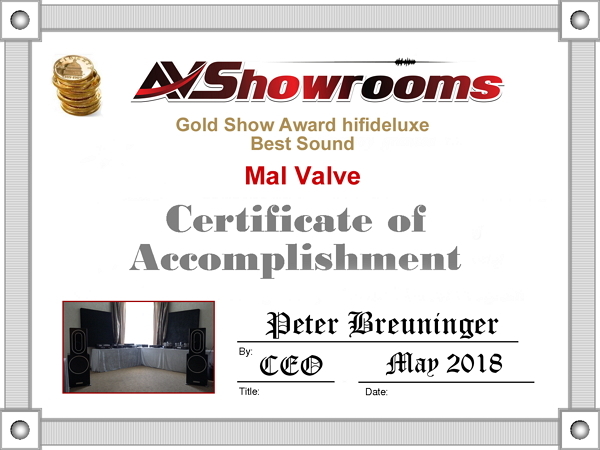 There’s lots to show in the Malvalve room and we’ll walk you through everything on the AVShowrooms’ video. We played a track from the Michel Jonasz CD “Où Vont Les Rêves” and the singer’s voice rolled forward in the room. 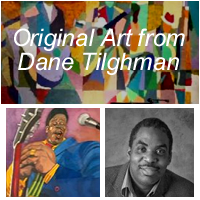 The sound was detailed and musical with the Malvalve signature organic quality. All the rooms had great sound, these rooms just stood out! My favorite show for its intimacy and its passionate exhibitors and manufacturers. Every year, there are new and innovative designs from audio engineers reassuring me the human spirit continues to create and improve for the love of music and invention. This year it was window loudspeakers from AER, full range drivers with cones in the shape of a flower from Cube among so many others and they are all captured on AVShowrooms’ videos.